Through Craigslist I found this Ridgid Radial 10" Arm Saw for $175.It was in good condition and I only had to make a few minor adjustments so it would cut perfectly. The first upgrade I bought for this saw is a HTC 2000 universal mobile base. I was able to get it for $25 at rockler with a 50% off coupon. 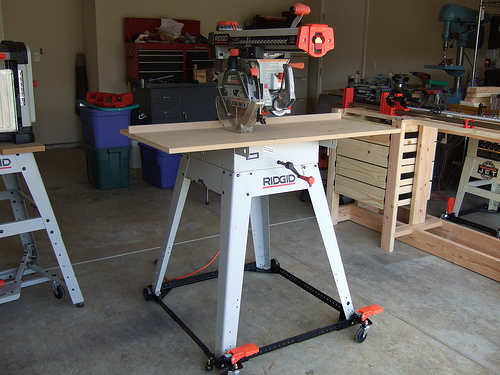 UPDATE: Jan 31, 2011 - I sold the radial saw with the HTC 2000 mobile base, but kept the Kreg measuring system for $220. That is not too bad, since I used it for 4 year and still made about $20 on top of what I originally paid.